The Nexus Q is Google's $299 cloud service-streaming box—er—orb. It's only for Google Play and YouTube. Plus! It has trippy flashing lights and looks like an alien weapon. But is it any good? 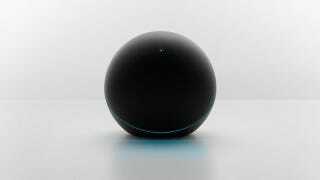 At its core, this orb is an Android accessory. It's designed to be controlled by your phone or tablet which talks to the Nexus Q via Bluetooth. The Nexus Q pulls all its content from the internet via your home Wi-Fi network while you sit on your couch and us your phone as a remote to play music and videos. It only works with Google-owned services: Google Play, Music, and the new Google Play TV as well as YouTube. The device plugs into your AV receiver, HDTV, or directly into speakers. Welcome to Google's vision for a media streamer—hope you don't like your Netflix. Several facets of the Nexus Q's design are based on interesting observations about music—even if the solutions are somewhat odd. It has a weird spherical design and night club lights because Google thinks music can also be a visual experience. During today's Google I/O keynote, an exec observed—rightly—that listening to music is an isolating experience these days. That's where the "social" part comes in. Google wants your to sit around in your living room making playlists of songs and videos with your friends. Nothing like hanging out and staring at your phone. The Nexus strongly resembles the Project Tungsten streamer we saw at last year's Google I/O. The conceptual hardware was an Android-based media device that's plugged into every room of your house. The promise: Sonos-like control your music plus media streamer-like access to streaming services. Now we finally know more about Google's plans for your entertainment. Other features? The Nexus Q has a built-in, 25-watt amp, which is enough power to drive a couple of small speakers. This little globe of streaming content is tiny: It's just 4.6 inches in diameter and weighs just two pounds. It carries 1GB of RAM, 16GB of flash memory, and the same processor as the new Nexus tablet. Google is also selling its own accessories for the Nexus Q. The Triad bookshelf speakers are supposedly specifically optimized for the Nexus Q. They've got one-inch tweeter and 6 1/2-inch subwoofer. Only $400! Oh, and there are even special Nexus Q speaker cables.